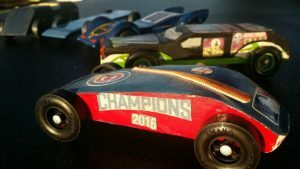 Calling all engineers, amateur race car designers, and parents who’ve painstakingly “helped” their scout build a Pinewood Derby car! Dust off your hand saw, sandpaper and decals. Finally, you can stand proud and build the most awesome car ever. And we won’t make you pretend a kid did it. ENTRY FEE: $20 online registration through the Park District. Registration cost is the same if you have a car ready or if you need to buy a kit. 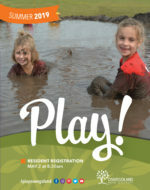 Register online through the Park District. Print a registration receipt. Bring receipt to Boulder Point Center, Zero Boulder Hill Pass, Montgomery beginning May 3rd to receive your derby car kit. 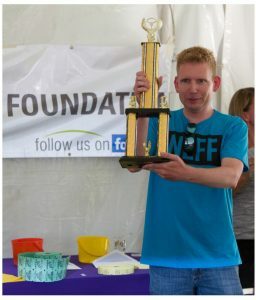 Last year’s PrairieFest Grand Prix: On June 16, 2017, the Oswegoland Park Foundation was proud to host its first annual PrairieFest Grand Prix, an all ages Pinewood Derby, located on the PrairieFest grounds. Congratulations to Andy Clements, from Weblinx on being the first derby champion. No wheel bearings, washers, bushings or springs. Only the wheels and axles provided in the kit are permitted. Details, such as decals, steering wheel and driver must fit within the maximum length, width and weight specifications. If a car does not pass inspection, the owner will be given time within the official weigh-in period to make adjustments. The Oswegoland Park Foundation is 501(c)(3) nonprofit organization dedicated to funding the development and enhancement of park district initiatives to create unique recreational experiences for the Oswegoland community. 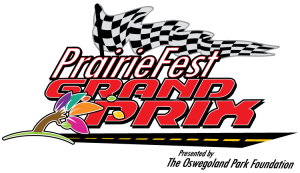 It focuses on projects not covered by local tax dollars and proceeds from the PrairieFest Grand Prix will be used toward that mission.